Sakina is an Indian who loves Indian street food and also spends her time occasionally cooking snacks of different cuisines. Aaloo tikki chaat is a famous healthy Indian snack filled with abundant flavors and colors. It is loved by everyone, be it a kid or an adult. 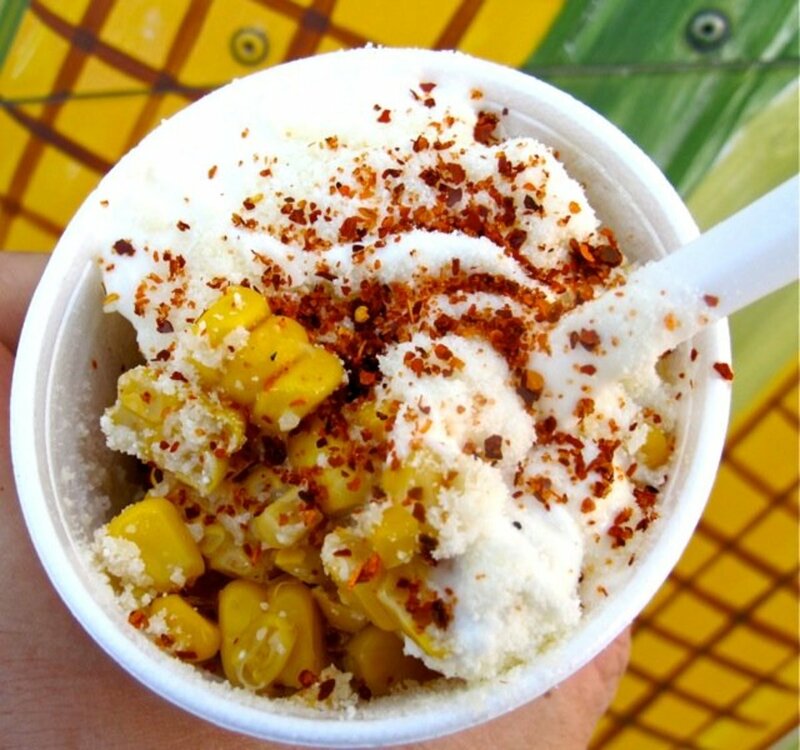 It is also found in many street food shops, where people enjoy this delicacy. This recipe can also be made at home with many variations. 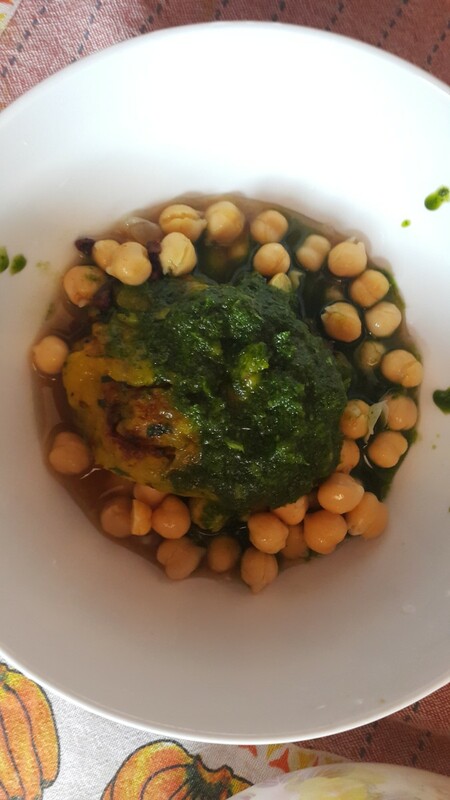 Here, I have made a simple aaloo tikki chaat topped with boiled chick peas, tamarind-jaggery chutney (sauce) and coriander-chilly chutney. 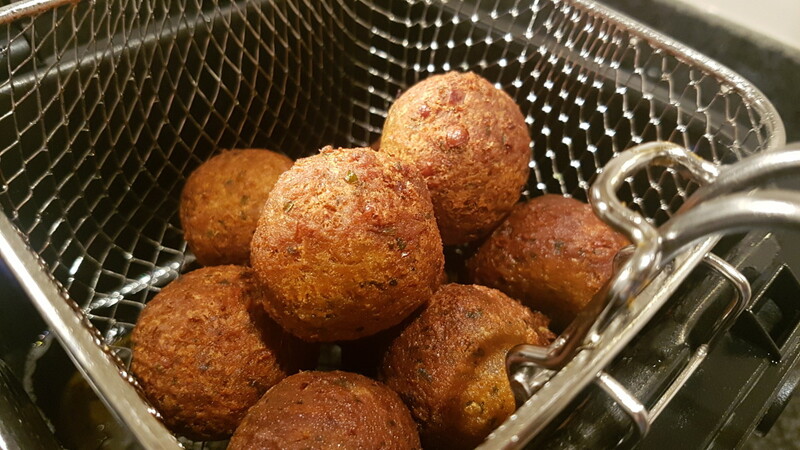 It can also be made by topping the potato patties with spicy chickpeas curry. 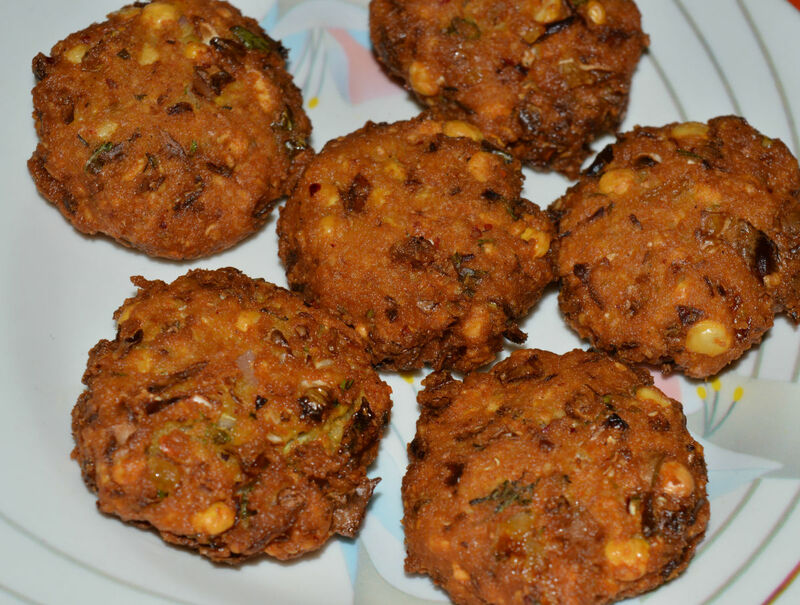 This way, the recipe is named as chole tikki chaat. The left over chaat can also be made into a veggie burger or sandwich. 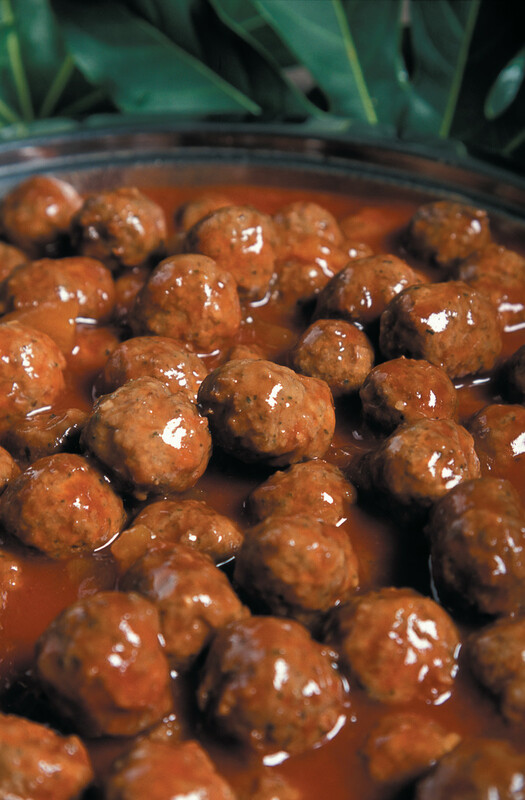 This dish is wholesome and easy to make. Wash and make slits in potatoes (for quick boiling). Put potatoes in a pressure cooker and let them boil till 3-4 whistles. Put tamarind and jaggery pieces together and add half glass water and leave to boil till consistency is fine. After it is cooled, squeeze tamarind pieces till only the seeds are left. Your sweet chutney is ready. 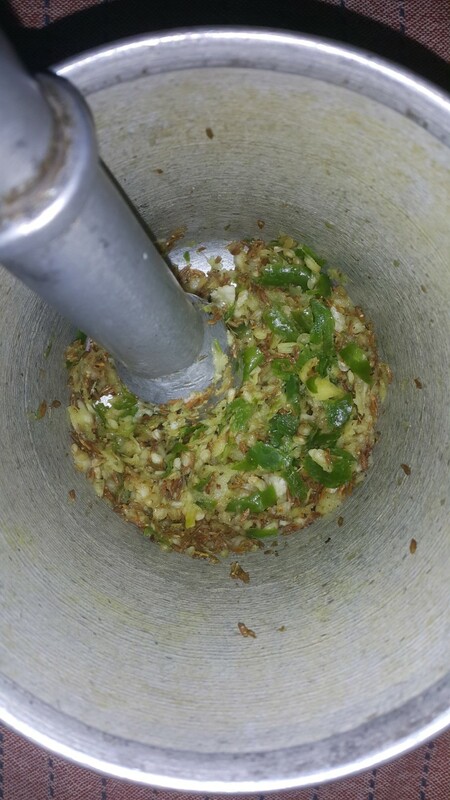 Put ginger, garlic cloves, chillies, little salt and cumin in a mortar and pestle and grind them into a fine paste. Take 1/2 tsp oil and saute the chopped spices for a minute. 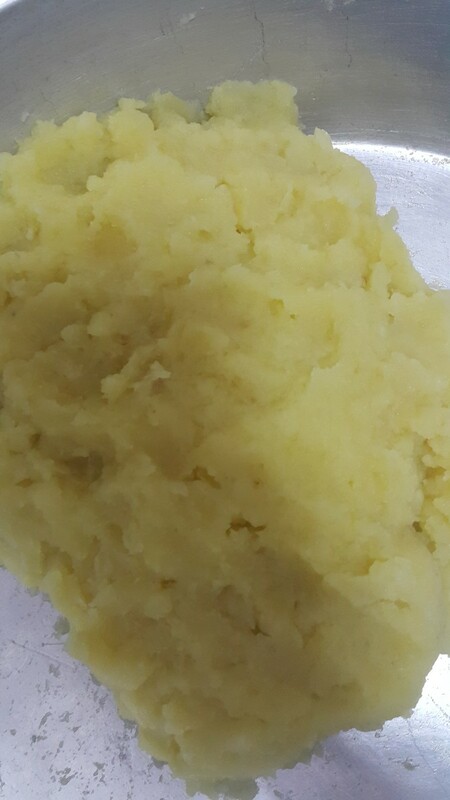 Mash potatoes finely. Add sautéed spices, turmeric powder, red chilly powder and chaat masala powder. Chop coriander leaves and add few lemon drops. Mix everything properly. Take a small amount of this mixture and make tikkis/patties with your palms. 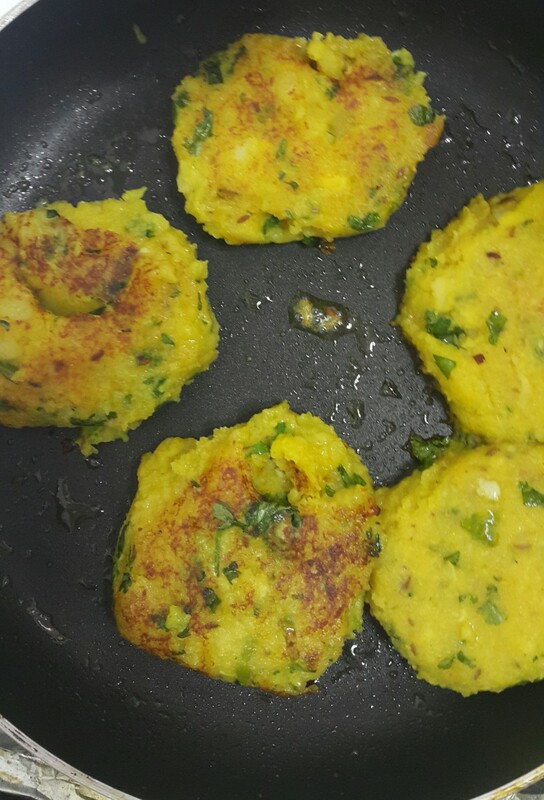 In a non-stick pan, add pure ghee and potato patties to it. Shallow fry till patties are golden brown. Take coriander leaves, little salt, water and 1 green chilly and grind them to a fine sauce. Your spicy chutney is ready. Take a bowl. 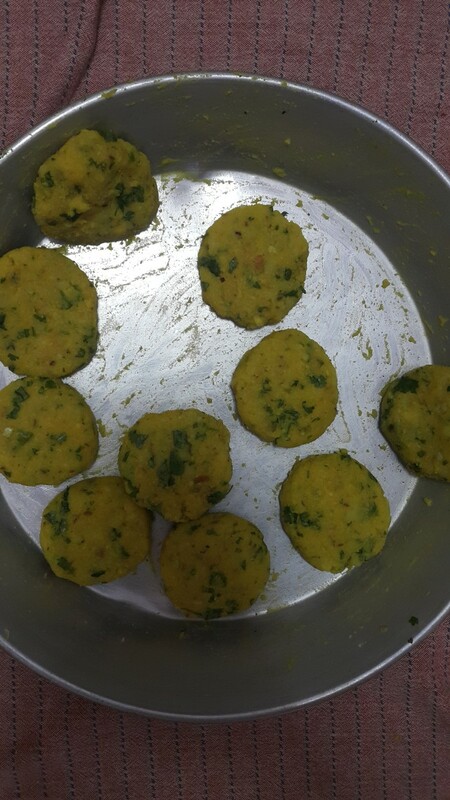 Place two aloo tikkis/ potato patties, add few chickpeas and two tbsp of both the sweet and spicy chutneys. You can also sprinkle fresh pomegranate seeds, chopped onions, and sev on it, for more taste. Serve after cooking immediately as patties may turn soggy if left for long time. 1. Make slits in potatoes and boil them for 4-5 whistles in a pressure cooker. 2. 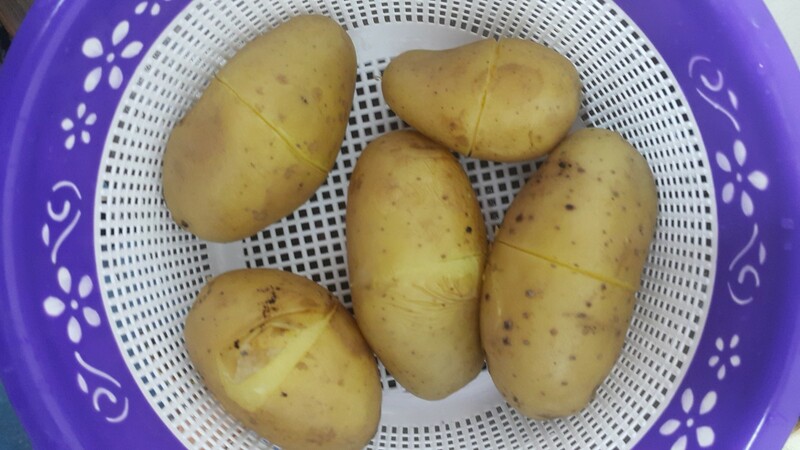 Strain boiled potatoes properly and make sure no water is left in them. Mash them finely. 3. Add garlic cloves, ginger, green chilles, salt and cumin in a mortar and pestle. Grind them into a fine paste. 4. Take 1/2 tsp of oil and saute the ground spices for a minute. Make sure you don't burn them! 5. Add sauteed spices, turmeric powder, red chilly powder, chaat masala powder, chopped coriander leaves and a few lemon drops. Mix everything properly. 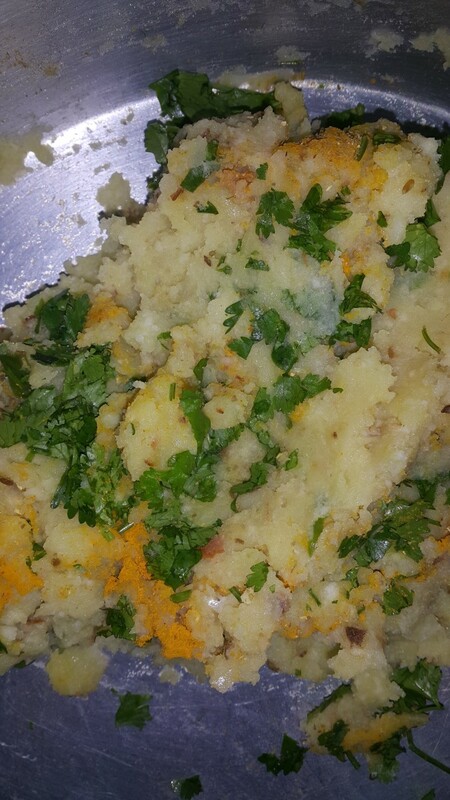 Sauteed spices, turmeric powder, red chilly powder, chaat masala powder, chopped coriander and lemon drops added to mashed potatoes. 6. Take a small amount of the mixture and make a ball out of it. Press it in between your palms to give it the shape of a patty. 7. All potato patties are ready. 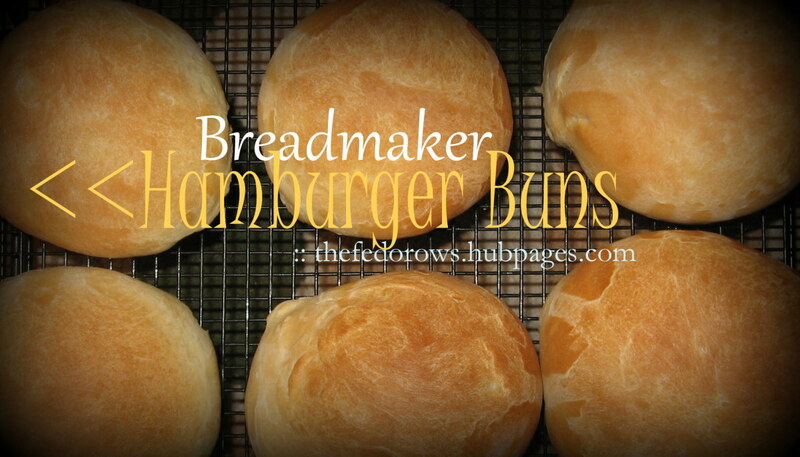 You can sprinkle some bread crumbs on the patties to make them firm. This step is optional. 8. In a non-stick pan, add the potato patties and sprinkle pure ghee on them as well as the sides of the pan. Shallow fry till patties are golden brown. 9. Make tamarind-jaggery and coriander-chilly chutneys. Assemble all ingredients together. 10. Place two aaloo tikkis/potato patties in a bowl. Pour some plain boiled chickpeas on top. Add two tbsp of both the sweet and spicy chutneys (sauces). I have included a video showing how chole tikki chaat is made. 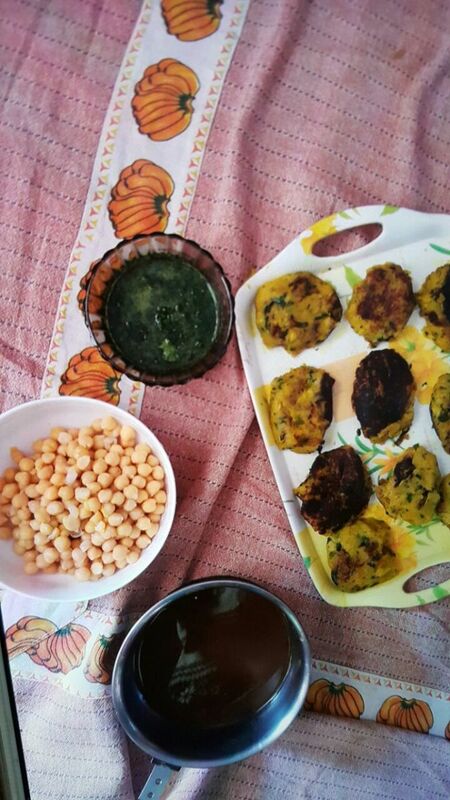 My recipe is aaloo tikki chaat just topped with plain chickpeas. If you watch the video, ignore the part where the chole/chickpea curry is made. If you would like to make it that way you can do that too! Please Rate After Trying this Recipe. Have you ever tried Indian street food? You are truly welcome. You are worthy. If you offered a take-out order service, I would buy five big orders of this nectar-of-great-food. Please continue to provide such great hubs as this. Thank you for the kind comments and for stopping by to read my recipe. I'm not sure about that myself, I want to ask this question in the forum. A tempting chat recipe. The video you have uploaded is also nice. I wanted to know whether we can legally upload other's video? I am also new in the writing field. Thank you. Oh my word, my mouth is watering now. The pictures and the video you posted are lovely. This is definitely something I'll be trying. 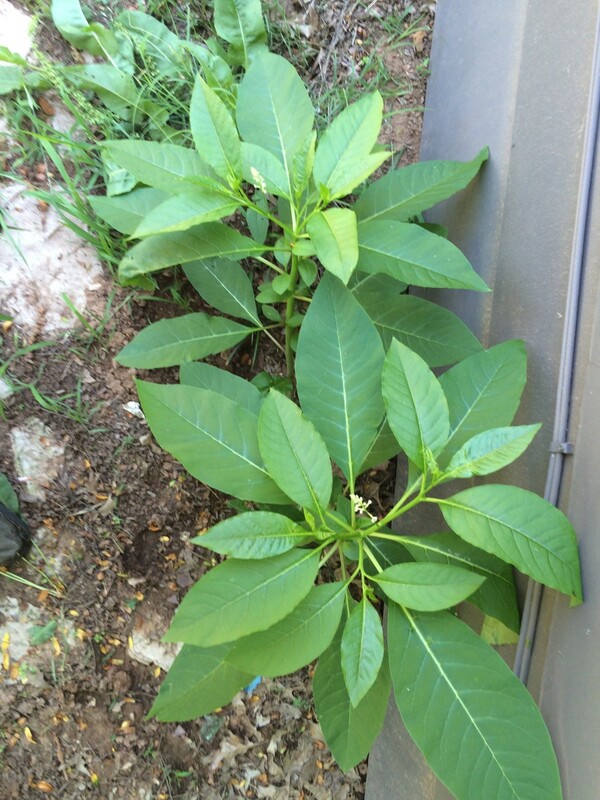 Thankyou for sharing your recipe! Thanks a lot Hatim! :) Do try this recipe and share your opinions about how it turned out. I appreciate your valuable feedback on my hub. 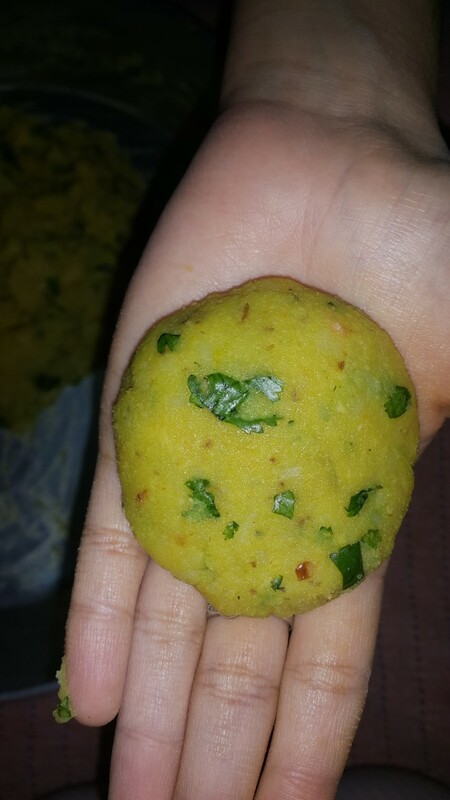 woww it seems soo yummy i have never tried this before but after reading your hub on aloo tikki which really looking amazing and attractive i would like to try this once in my life. Thanks a lot for stopping by and appreciating my dish. Yes, you are right about this recipe being gluten free. 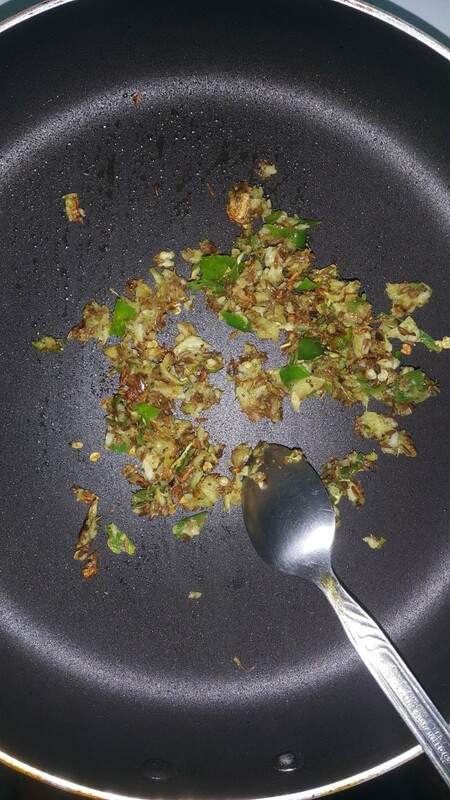 Also, shallow frying in ghee adds a rich flavor and enhances the taste. Thanks once again for flipping my article. It means a lot! 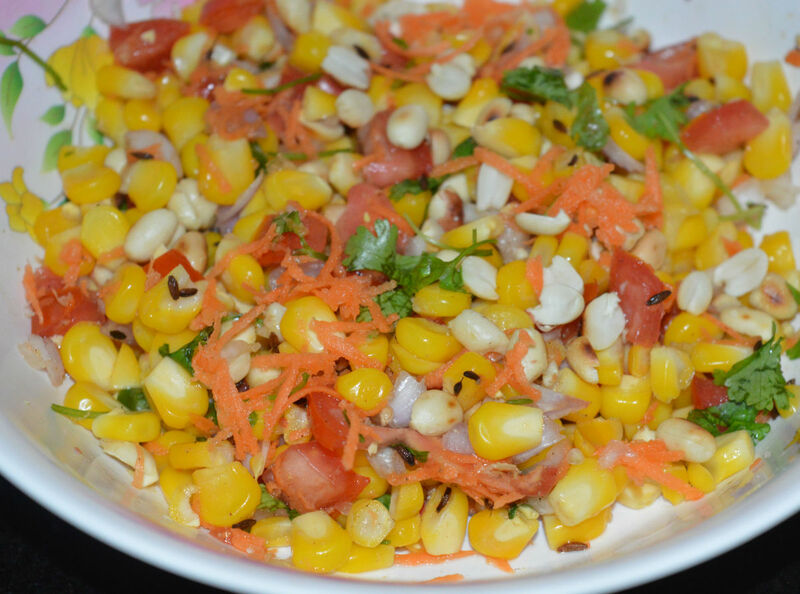 :) Do try this recipe and tell me what you think of it. This sounds wonderful and seems pretty easy to make! Also without the breadcrumbs it would be gluten free. I flipped your recipe to one of my magazines. Thanks for providing it! I keep watch for more great recipes. will go far on and off of HP. I meant every word of my comment. You deserve them and lots more. Keep up the great work and have a safe and peaceful day. 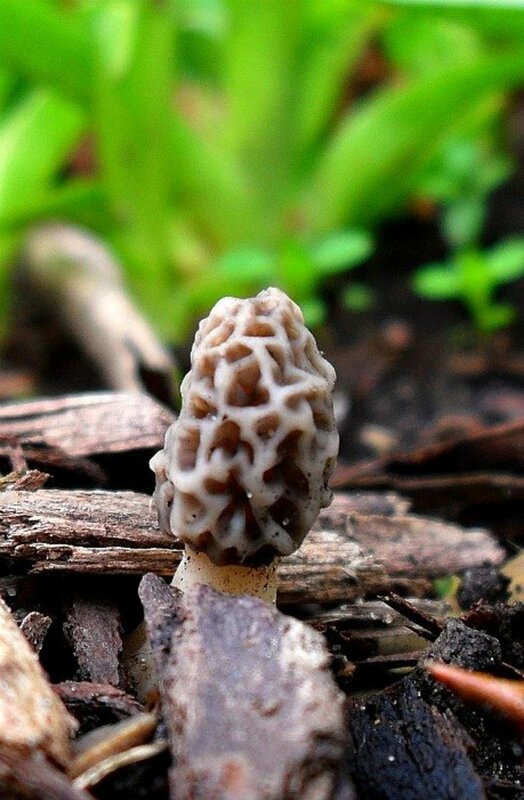 Very nicely written with good detailed description and video. make me very hungry. I love spicy foods very much. You just keep up the great work and success will be yours soon. That's so sweet of you. I am so glad to recieve your warm comments. Thank you so much for stopping by and reading my work. This hub was phenomenal in writing style, lay-out, graphics, and topic. If HubPages still had the voting choices above the comments, I would have already voted this up; interesting; colorful; and all positive remarks. I am so hungry now. A great sign that this hub was GREAT!